This is the final installment of a 4-part series by KC Robotics about the automated arc welding industry. The job shop owner was struggling. The RFQs kept coming in but no one came back. The pile of quotes was stacked up on his desk, bids lost to cheaper companies all over the country. He needed more purchase orders and knew he needed to cut production costs to stay afloat. Time was short and resources were just as limited. After researching his competition he discovered a trend. They were all automated. If you Google “automated robots in job shops” you get about 1.7 million results. This isn’t unchartered waters. There are several stories of increased productivity, quality, and in the end, profits. Companies that went from one guy and a CNC machine have grown to 50 people, a few robot cells, and a few more CNC machines. The benefits of automating job shops have been recorded in various publications over the years, touting better productivity and quality, and lower costs. Few of them have mentioned the potential losses these companies face if they fail to take charge of their production line and save their company from lost bids and in the end, lost revenue. The best thing to happen to job shops recently is the evolution of pre-engineered welding cells, modular robotic cells that do not cost as much as custom built solutions and have a smaller lead time. Upgradeable and redeployable at any time, pre-engineered welding cells give companies such as jobs shops a more off-the-shelf approach to automation. When you have a two shift team working the same machine, very often they do not work exactly the same. One worker may churn out 1,500 pieces a day while the next, 2,500. This fluctuation in production makes it difficult to predict a delivery time estimate. By integrating a pre-engineered robotic welding cell the number of worked pieces in a day stays constant making that promise to your customer for an on-time delivery a kept promise. We all want to ensure great quality of our product however not all workers do the same work. Even using the same weld gun, one worker might decide it easier to weld a different way. Using a robotic weld cell creates a standardization of work. For those who want further consistency, or need adaptive welding, laser and vision technology can be included with pre-engineered solutions. Imagine bidding on a job and saying to your potential customer, “I can guarantee consistency.” It makes a difference. All of these benefits to integrating a pre-engineered weld cell in your job shop will contribute to the overall factor in won and lost bids. When it comes down to the paper and pen, price matters. “I ask him, how many quotes do you do in a week?” Says Tim Nacey, KUKA Robotics Senior Key Technology Manager of Metals about a fabrication shop he visited recently. It wasn’t a week that made the difference, in fact, they were quoting as much as five every day. “My next question to him was how many do you not get and lose because your price wasn’t right?” The answer was 99%. But it never occurred to the job shop owner that his competition was using automated equipment to bring down their costs and ensure quality parts. A pre-engineered welding cell typically has an 18-month ROI, after that the only costs incurred are welding supplies and maintenance. They bring lower labor costs, higher production rates, better quality parts, and in the end, more contracts. So what happens when you don’t automate? It’s scary to think about, but every day job shops consider whether or not to automate. Consider the fabricator from above whose competition had already invested in automation. If your competition is getting lower costs per part and have automated equipment and you are losing bids every day, you will not survive. No contracts means no production or growth. Another reason why we see job shops integrate welding cells into their facility is because they want to grow. If your facility is at capacity with the labor and equipment you have, you either have to invest in more labor, equipment, or both. Pre-engineered welding cells allow you to invest in both but save money in one area by reducing labor needs. If you don’t invest in either, growth simply cannot and will not happen. How many times have you pushed back a delivery time disappointing your customer and potentially losing out on future jobs with them? How many times have you or one of your employees worked overtime to finish a job that was expected in the coming days which you discovered were 25% short on pieces? Money and time are big decision makers with companies looking for job shops now. Companies are no longer limited to the phone book when it comes to job shop work. Now, they can get a bid from a shop half way across the country even if you’re next door. In the Regional Manufacturing & Distribution Survey by Clark Schaefer Hackett, manufacturers in the Ohio region reported the following as key changes they planned on making in the new year: succession planning, aggressive marketing & sales, development of new products or enhancing existing products, focus on expansion of both foreign and domestic markets, and improve productivity. Very few investments can affect all of these, automated equipment such as pre-engineered welding cells from KC Robotics can. This is a 4-part series by KC Robotics about the automated arc welding industry. As a leader in robotic arc welding, we are pleased to have been able to interview welding veteran and KUKA Robotics Senior Key Technology Manager of Metals Tim Nacey about the industry and the possible growth manufacturers can see just by integrating a welding cell on their assembly line. Come back to read the next blog about robotic welding applications. 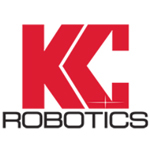 KC Robotics is an industrial robotic sales, service, and industrial company located just north of Cincinnati in West Chester, Ohio. Incorporated in 1990, KC Robotics works with manufacturers across the United States to develop cost efficient and productive automated solutions to give them a competitive advantage in today’s market. From arc welding to material handling, KC Robotics designs, supplies, installs, and services industrial robotic systems from the world’s leading OEMs. If you are interested in knowing more about how KC Robotics can help your production line, call (513) 860-4442. By finding the right integrator, like KC Robotics, the benefits continue for the life of the robotic cell and beyond. As your provider of integration, installation, sales and maintenance services, you can have confidence in your production line every day. Call us at 1-800-7ROBOTS (1-800-776-2687) for more information on our custom and pre-fabricated welding cells available for integration.